We have all been there every now and again. When we have painted the town red, green or even blue, you come in slightly worse for wear. That thumping head coupled with the pang for something rich only adds to the day after the night before. But help is at hand thanks to our trusty pair of sunnies! In fact, you may not want to remove them after this spectacular bombshell we are about to drop. Aside from looking slick and offering protection for your peepers, sunglasses may have another hidden benefit. It turns out that wearing your shades can help eradicate both squinting and a reduction in wrinkles. We’ll let you pick yourself up from the floor! That’s right, even when the weather is overcast, your shades can protect you from those nasty UVA/UVB rays. It is essential to find sunglasses that not only offer UV protection but ideally polarised lenses. These eliminate all bright light and glare, decreasing the amount you squint even when it is cloudy. You can forget your anti wrinkle cream and beauty products, sunnies could be the way forward in stopping those crows feet from appearing! Invest in a pair of sunnies and stop those wretched wrinkles from coming through. What is not to like! This is especially the case if you find the right pair of sunglasses. They are ideal for spicing up your wardrobe not to mention a possible anti wrinkle solution – on the surface. “Wearing sunglasses will prevent squinting, and thus help prevent crow’s feet. They also block out UV rays so the fragile skin around the eyes is protected from sun damage. But, the glasses must have adequate UV filters in them.” said Dr. Ava Shamban, a dermatologist from Beverly Hills and author of Heal Your Skin. She added that there are two specific ways in which your simple shades can give the maximum protection. In the first instance, UV filters on glasses are absolutely essential, reflective lenses may look like they allow less light in but it actually has the opposite effect. “Aside from damaging UV rays getting through the lenses, they can hurt your eyes and vision. Lenses without UV protection can contribute to the formation of cataracts. Wraparound styles generally give the best coverage because a lot of UV rays can still get at the eye area via the open sides of the frames,” she noted. Naturally, you should always apply sunscreen when it is warm not to mention cloudy. This is because the rays can still penetrate through the clouds onto your face. When it comes to coverage, the most important areas generally tend to be around the nose and eye regions. Dermatologists have gotten in on the sunny act, some have proclaimed that the type of shades is vital in order to avoid those lines. For example, it’s much better to opt for plastic or rubber sunglasses as metal frames tend to reflect the rays just under the eyes. This leads to possible sunburn and damage to the skin. Oversized frames are another way of giving added protection to your face thus avoiding wrinkles. After all, the more lens there is the less chance you will become sunburnt. If you are after the perfect pair of plastic or rubber sunnies, we have them waiting for you over at our site here. 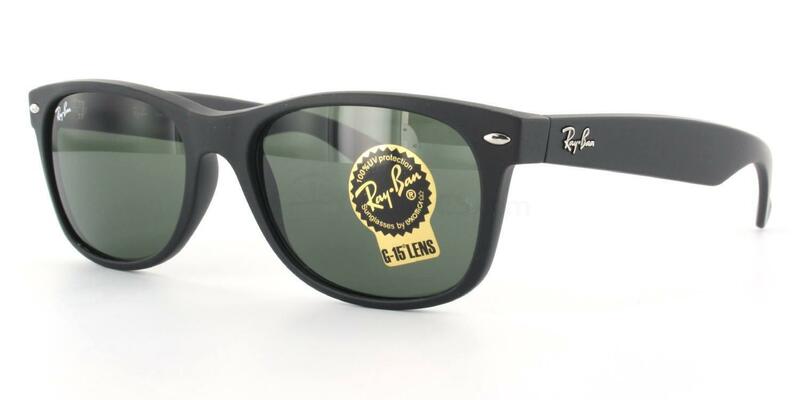 Take for example the brand new Ray-Ban R2122. Sportier than Mel C doing the 100 metres, this designer pair is a popular look for those wayfarer fans. Featuring a spanking new rubber finish, the Ray-Ban RB2132 New Wayfarer Rubber sunglasses are gunning for gold medal position. Suitable for both men and ladies, they are extremely versatile and suitable for a number of different occasions. Whether you are mashing it up in Marbs or mountaineering in Mont Blanc, you’ll love this pair. Take your sporting prowess to the next level with the special G-15 lenses. This ensures you are protected in all manner of weather conditions. Now who said anything about beauty only being skin deep? Wrinkles may occur especially when we grow old. Less collagen outcome in pendulous skin with wrinkles. Lots of factors promote to this process. You can prevent wrinkles naturally: Don’t Smoke,Stay Hydrated,Eat Lots of Antioxidants,Use a Nontoxic Moisturizer,Eat Lots of Saturated Fat,Use a Nontoxic Sunscreen,Moisturizing Face Masks,Fermented Cod Liver Oil, Get Plenty of Sleep and Gelatin. Why gelatin? Gelatin is made from cooked collagen (from pigs and cows). So taking a dietary supplement of natural collagen is a magic fix!